Strong earnings performance helped send the the gym stock to new heights last month. Shares of Planet Fitness (NYSE:PLNT) climbed 12.5% in November, according to data provided by S&P Global Market Intelligence. The budget-priced gym company's stock gained ground following its third-quarter results, raised full-year sales and earnings targets, and announced some encouraging business news. Planet Fitness reported third-quarter earnings results after the market closed on Nov. 6, recording another period of strong revenue and profit growth. The stock is now up roughly 55% year to date. Sales for Planet Fitness's September quarter climbed 40.2% year over year to reach $136.7 million, with the impressive growth stemming from a 9.7% increase for same-store sales, the opening of new locations, and rising equipment sales to franchised fitness centers. Adjusted net income rose 47.9% year over year to hit $27.7 million, and adjusted earnings per share came in at $0.28 -- up from per-share earnings of $0.19 in the prior-year period. 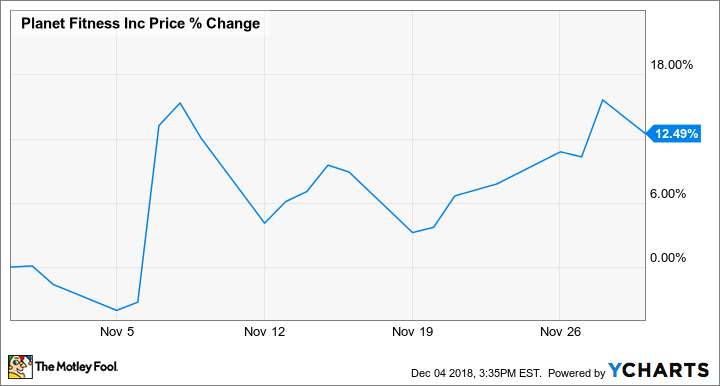 The average analyst estimate had called for earnings of $0.24 per share on sales of $126.1 million, and the strong performance beat helped Planet Fitness stock hit new lifetime highs in November. Later in the month, Planet Fitness published press releases revealing that Newsweek had ranked it No. 1 in customer service among fitness centers, celebrating news that the company's top franchisee had just opened its 100th location, and detailing plans to buy back $300 million in stock. 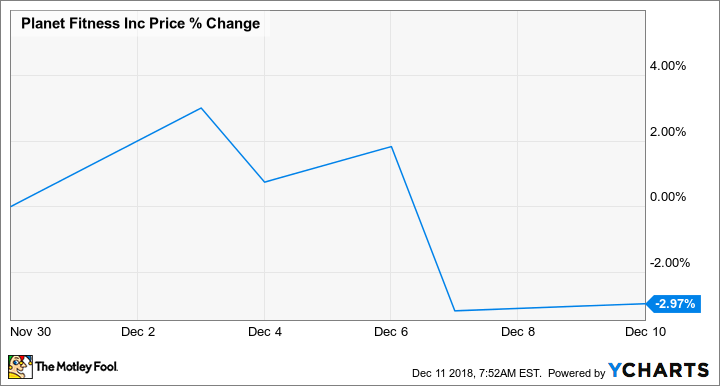 Planet Fitness stock has given up some of its gains from November amid sell-offs for the broader market, with shares trading down roughly 3% in December so far. Management is guiding for full-year revenue to increase 33% year over year and come in at $572 million, ahead of its previous growth target for 26% annual revenue growth. Management now expects full-year earnings per share to rise 43%, up from its previous growth target of 33%, and come in at of $1.20. Shares trade at roughly 45 times expected earnings and nine times expected sales.